Does the SPF of Your Sunscreen Really Matter?? There are so many varieties of sunscreens available in the market that claim to protect your skin from the heat. And, the specifications of each of them are enough to confuse the buyer! These specifications range from waterproof, sweatproof, UVB, UVA, SPF 15, 20, 25, 50 etc. What do they all mean? Do they really help you? UV rays type A (UVA): These rays, though may not cause visible sunburns can penetrate deep and may damage the tissues and cause wrinkles. UV rays type B (UVB): These types of rays are more intense and can cause tan and sunburns. SPF (Sun protection factor) number indicates collective protection to your skin from both these types of rays. 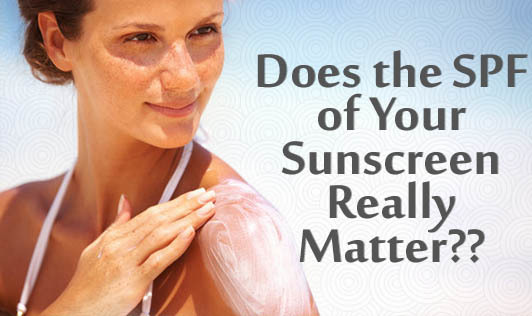 A sunscreen with SPF 30 can provide your skin 30 times the protection of no sunscreen. So now that you know what SPF means, can an SPF of 100 give 100% protection to your skin? No. Even a sunscreen lotion with SPF 15 can block 90% of UVB and UVA rays. So, you don't need a sunscreen with SPF 80 or 100 for adequate protection. And many skin experts say that most SPF numbers are not accurate. The results may vary individually as certain skin types tend to burn faster than others. Skin experts recommend an application of sunscreen every two hours when outdoors especially if swimming or sweating a lot. Even if you are using an SPF 100 or 150 and it claims to be waterproof, sweatproof and provides all-day protection, it needs to be reapplied every few hours to get optimal protection especially if you are outdoors. Remember, that sunscreens provide limited protection. Therefore it is recommended to seek shade, wear hats and a pair of sunglasses if you are out in direct sunlight for prolonged periods of time.